The real estate market in Orlando -- home to Disney and a slew of other theme parks -- has been anything but magical lately. Prices have plummeted 43% since 2006, according to Local Market Monitor. 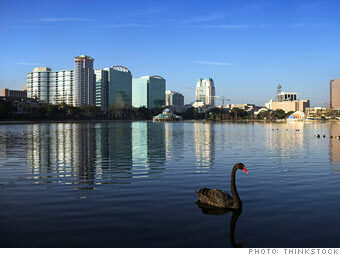 Winzer projects little in the way home price gains Orlando over the next three years. Rents, on the other hand, are expected to climb by a healthy 17% clip, he said. The area's ties to tourism should help as the economic recovery gains traction, he said. Visitors keep coming to the theme parks here, despite the lukewarm national job picture. If employment ever heats up, the area will attract even more visitors and that means more jobs for local residents. He expects that real estate investors will net about 3% above the national average.